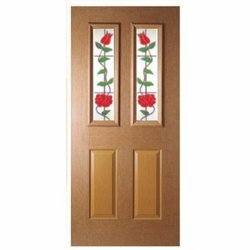 Four Panel Glass Doors offered come designed in pane glass as well as solid wood construction so as to provide for desired elegance as well as durability as desired in these doors by the customers. Being handcrafted in multitude of glass designs, these can also be developed so as to match with exterior door collections. We can also customize these as per the requirements of the customers. Exquisite glass designs for creating one of a kind interior space. Looking for Four Panel Glass Doors ?